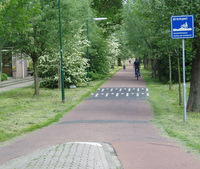 The designer must understand cycling as a mode of transport. In this manual, it is strongly recommended that designers should cycle and be fully familiar with the cycling environment and needs. Designers of transport infrastructure must seek to maximise road safety for all road users, including cyclists. Quality of Cycling Surface: Cyclists are safer when focusing solely on road traffic and not distracted by sub-standard cycling surfaces. Junction Design: Most collisions involving cyclists occur at junctions. 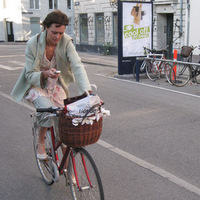 Evening and Nightime cycling: Poor lighting and personal security concerns will deter certain cyclists. Drainage: Blocked drains, poorly located gullies and manholes. The cycling network should link all main origin and destination zones / centres for cyclists. 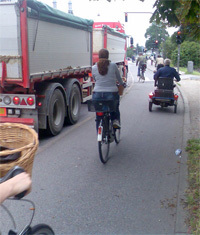 A well-targetted cycle network should carry the majority of cycle traffic (in cycle-km terms). Cycling routes within the network should be logical and continuous. Delays, detours, gaps or interruptions should be avoided. Markings and signage should be clear and consistent. Continuity of Route: It is illogical to discontinue cycling provision near busy destinations to accommodate or maintain other traffic flow. Junctions: Cycling routes approaching, going through and exiting junctions should be obvious. Time Plating: Discontinuity can occur by virtue of loading, parking or when general traffic is allowed in a bus lane. Cycling infrastructure should be as direct as possible, minimising any delays or detours. 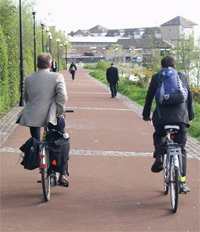 A well designed urban cycle network should confer an advantage in terms of average distance or journey time when compared with other transport networks. 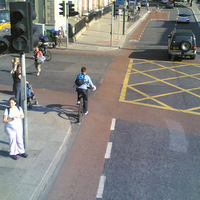 Traffic Signals: Sequencing of signals to minimise waiting time at junctions and crossings for cyclists. Detours: Short detours to maintain momentum and avoid local conflicts. Long detours are unlikely to be used. 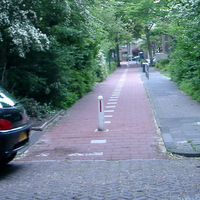 The cycling environment along a route should be pleasant and interesting. This is particularly important for beginners, tourists and recreational cyclists. Monotony and exposure to the elements are unattractive to cyclists, as are litter, uncontrolled animals and poorly maintained environments. Shelter: Planting wind breaks. This can also provide visual interest. Maintenance: Keep cycling surface in good condition and clear of debris. Lighting: Ensure that cycle routes are adequately lit so as not to deter evening and night time use. Cycling infrastructure should be designed, built and maintained for ease of use and for comfort. This is particularly important for beginners, tourists and recreational cyclists. Anything that causes discomfort or delay, or requires a disproportionate amount of effort, is likely to result in the cycling facility not being used. Improved cycling comfort can be achieved through providing effective width for cycling links; well-drained high-quality surfacing; improving shelter; minimising stopping, delays, detours etc. Stopping and Delays: Minimise the number of obstructions or detours that impact on the cycling momentum. Surface Quality: Ensure cycling surface in smooth and continuous. Shelter: Minimise exposure to inclement weather.